Archaeologist Day is a professional holiday that was celebrated in the Soviet Union on August 15. It is still observed in some former Soviet Republics, although Ukraine is the only one where it has an official status. Unlike many other Soviet professional holidays, Archaeologist Day was never official. Soviet archaeologists began to celebrate it in the mid-1940s. It is unclear why they chose August 15 as the date of their professional holiday. According to the most popular theory, this date commemorates the birthday of Tatiana Passek, an outstanding Soviet archaeologist. Passek was the principal specialist in the study of the Tripolye culture. After the collapse of the Soviet Union, Russia, Ukraine and Belarus continued to celebrate Archaeologist Day. 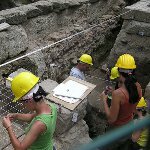 In 2008, President of Ukraine Viktor Yuschenko officially proclaimed August 15 as Day of Archaeologist to celebrate the contribution of Ukrainian archaeologists to the development of archeology and preservation of the country's archaeological heritage. In Russia and Belarus, the holiday is still unofficial.